Life in Poulton would have been very hard for the average family. Most of the population, probably in the region of 300, would have lived in small cobble-built cottages with mud floors and thatched roofs which huddled round the Market Place and the six streets leading off it. Parish registers and gravestones show the high death rate, particularly amongst children. Poulton was badly hit by a 'plague' in the winters of 1622-24 during which many people died; it decimated the population of nearby Kirkham and caused havoc throughout the north west. Poor living conditions and an unhealthy diet meant people were unable to withstand any epidemic and many would not survive a particularly harsh winter. The area round Moorland Road, being close to the River Wyre and low lying, would have been where local people gathered rushes and cut wood to be put to various uses in their homes and the church - rushes for the floor, wood for furniture, agricultural tools, etc. The lack of any large areas of woodland left the land of the coastal Fylde unprotected from the salt winds and the bleak outlook was increased by the starkness of the great mounds of black peat stacked by each cottage to be used as fuel. During the Civil War people living in Poulton would have had divided loyalties as men from Lancashire were drafted into the armies of both Parliamentarians and Royalists. In 1642 a ship of Royalist supporters was stranded in the River Wyre. Most inhabitants of Poulton at this time lived close to the Market Place, with a small pocket of cottages in the nearly hamlet of Little Poulton. Each cottager would have a small piece of land where produce for the family's use would be grown and a few animals kept. Common grazing land situated on the outskirts of the town would be used in the summer months, possibly the origin of 'Higher Green' and 'Lower Green', known in the 19th century simply as 'The Green. During the 18th century improvements were made in methods of agriculture across the whole country which helped to raise the living conditions of the poorer people. Food prices stabilised, methods of farming improved and the devastation caused by epidemics ceased. Life in Poulton also improved for its inhabitants. In late medieval times a Moot Hall (or town hall) stood at one end of the Market Place and stalls ran down each side selling food and other produce. Stepping stones enabled people to cross the unpaved streets without stepping into the mud. Small cottages surrounded the Market Place, with the exception of the few grand three storey town houses with their slate roofs, built by local gentry families such as the Walmsleys and the Rigbys. James Baines, a wool merchant whose house overlooked the stocks and whipping post, left money in his will of 171 7 for free schooling and apprenticeships to be provided for poor boys of Poulton, Marton and Thornton. All three schools still exist today. The buildings on the west side of the Market Place were erected all at one time, in contrast to those on the opposite side. The awful events which necessitated this rebuilding must have remained in the memories of the inhabitants who witnessed it all their lives. As the funeral procession of Geoffrey Hornby passed through the Market Place to the church on March 5th, 1732, sparks from tapers set fire to the thatched roofs of the cottages on the west side of the Market Place resulting in the destruction of all the property. It was several years before the present buildings were erected in their place. A national collection was organised - known as a 'brief' - and the estimated cost of rebuilding was put at £1034. Timber which was re-used after the fire of 1732 was recently exposed when re-roofing work was being carried out on a shop on the west side, and has been preserved. A tithebarn, a station and a chapel have all come and gone in Poulton, leaving only street names to remind us of their presence. The tithebarn was replaced in 1969 by a car park. Its position so near to the centre of the town suggests it was an ancient site. Poulton's original railway line opened in 1840 running between Preston and the newly built town of Fleetwood, with the station at the corner of Station Road and the Breck. In 1896 it was rebuilt in its present position at the top of the Breck near to the town centre. The original Methodist chapel stood on the corner of Chapel Street and Queen's Square until a new one replaced it on Queensway in 1968. Poulton had two ports one on either bank of the River Wyre, on the south side at Skippool and on the north side at Wardleys in Hambleton. During the 18th century this was an important trading facility for Poulton, which had its own customs house, dealing in mahogany and flax with Baltic ports and coastal trade with farm produce to Liverpool, Lancaster and Cumbria. The rise of Glasson Dock and Fleetwood ended Skippool's importance as a port. Today it is a popular venue for sailing. 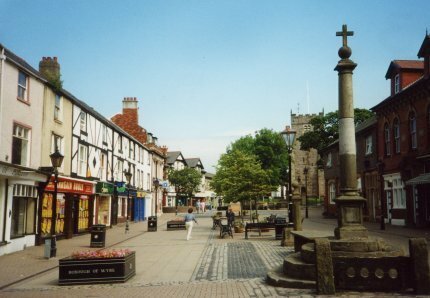 In recent years Poulton has grown rapidly and it attracts many visitors throughout the year. 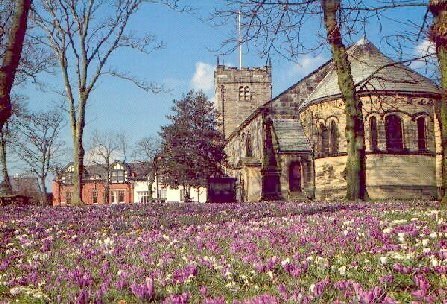 In early spring the churchyard is a carpet of purple and yellow crocuses. 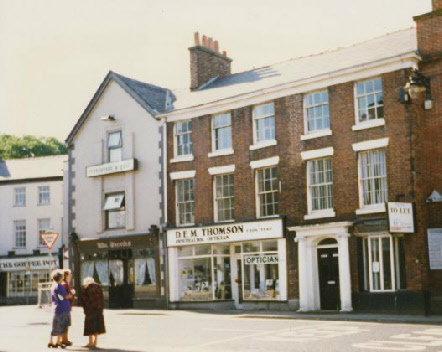 A series of historical plaques on various sites and buildings in the conservation area and a town trail will help the visitor to learn more of Poulton's history.